When you're in a rush and just had no idea what to wear but want to stay put together, an LBD has been my saviour. And I have been in a rush very often these days, I haven't really got the time to plan my outfit as per usual. So please bear with me while I go back to monochromatic outfit schemes once again. 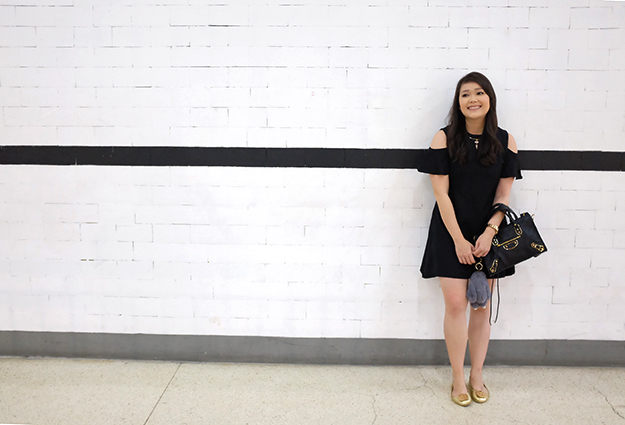 It was an easy breezy Sunday and I went for a casual side with my cold shoulder black dress which you can also easily recreate with this number from StyleWe.com . They have great selections, one of a kind clothing for women. This pretty dress can easily dressed up or down. Paired it with heels and red lipstick; it makes a great date night outfit. Or, you can go the other way; paired it with a gladiator sandals and some slouchy bags; a perfect hobo outfit for a day exploring the city. Direct link to this dress here. StyleWe provides exclusive pieces from various designers, making sure each of you get that high quality product on your doorstep. I browsed around and I did find their items are not the ones you usually see on the street. All the cutting edge designers and all the trends you can think of. One thing that makes me very interested was their gym-wear tho! It's tough business to look cute in the mornings while you're working out. A page worth looking at for some fitspiration :) Don't forget to check our Instagram as well.